Magazines and design blogs are full of stories of retirees downsizing to tiny homes to cut their expenses and responsibilities. With costs around $30,000 and monthly utilities as low as $15, some enthusiasts even say that trading a traditional home for a tiny house or RV allowed them to retire early. While the tiny house trend is pretty new, retiring to a life on the road in a recreational vehicle is an established tradition among retirees. Should an RV or tiny house show be your first stop once your final day on the job is over? Not so fast. Committing to a major purchase immediately after retirement is rarely a good idea, and there are plenty of important things to consider first. 1. Will your tiny home be legal? Federal codes as of 2018 state that a house must be at least 88 square feet, but many states have additional regulations. In areas of North Carolina, for example, you need at least 150 square feet, plus 100 square feet more for each additional resident. 2. What will you do with your stuff? The average retiree has a lifetime's accumulation of possessions in their home: Gifts from children and grandchildren, collections, holiday decorations, kids' left-behind sports trophies. A tiny house or RV won't have room for any of that. You'll have to dramatically downsize, whether that means putting things in storage, giving them away, or having an estate sale. 3. What will the furnishings cost? 4. Will you be able to age in the home? RVs and tiny houses are often perched on wheels or raised above ground. You may need to climb a ladder to reach your bed every night. What will happen if you end up using a cane or wheelchair? Will you be able to retrofit your tiny home or RV to make it accessible? I came across one retiree who had a rock-climbing harness modified to lift her into her loft every night; I can't help wondering how much she likes that setup if she has to use the bathroom at 2 a.m.
5. How will this affect family traditions? If you hold a big Thanksgiving dinner every year in your regular home, don't imagine you'll continue the tradition in your tiny home or RV — at least not in the same way. These pocket-size residences have no entertaining space, and their kitchens don't facilitate cooking for a crowd. What will happen to the events you used to host? Will you invite loved ones to camp near you and eat turkey at a picnic table? Or will an adult child take over hosting? 6. Where will you park? 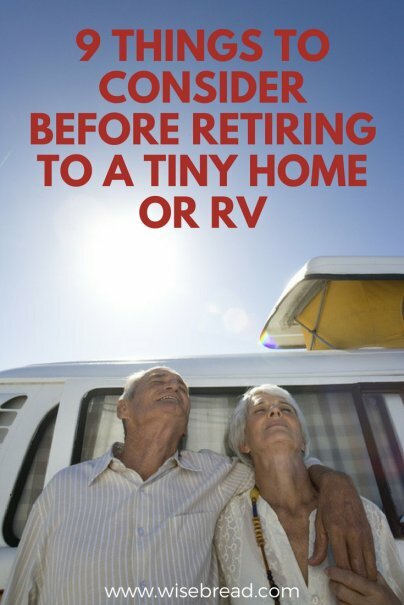 My husband and I sometimes daydream about spending our retirement parking an RV in the driveways of our grown children, visiting one after the other throughout the year. If this is your plan, what do your children think of it? Do they have an off-street place for you to park? What about water and sewage hookups? If you want a more permanent place for your tiny home, you'll need to find out if your state has tiny house co-ops, or what the rent would be in a trailer park. You can find out more about zoning through the American Tiny House Association. 7. Will your relationship withstand the change? If you and your spouse have both been working for decades, retirement itself will be a big change involving a lot more togetherness than before. Are you really ready to give up private spaces in your home to spend your days within a few feet of one another? If your spouse leaves his shoes on the floor, will it irritate you to no end that you can't even walk around them? Tiny homes and RVs typically have just one bathroom; are you ready to share? 8. Can you get a loan? 9. Which should you get, a tiny house or an RV? Some people wonder why tiny houses cost more than RVs. Is it just because they're cute and trendy? Actually, there is a substantial reason: A good tiny house should be durable enough for everyday use, while RVs are built for vacation use, and tend to fall apart faster. Whether you think a tiny house or an RV is your ideal future home, you should rent at least one before you jump in and buy. Weekending in various styles of tiny homes and/or RVs is a good start, but remember that vacation life is always easier and more fun than everyday life. If you are serious about making the lifestyle leap, consider packing up and moving to a rented tiny home or RV for a substantial amount of time, like six months or a year, before you start shopping in earnest.